MONTREAL, QC – CBN’s Quebec correspondent Chloe Smith reports that the 20th anniversary of McAuslan Brewing will be marked with a new limited edition beer to be released later this month. 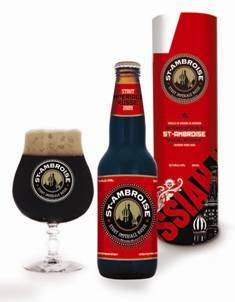 St-Ambroise Imperial Stout will be available in single bottles with a suggested price of $5.99. Only 9600 bottles have been produced, and distribution will likely be limited to Quebec, although that has yet to be confirmed. Damn it… the chances of that showing up in my NSLC are up there with that snowball in hell. I’d be just happy to get their regular stout back.